This film follows a pig farmer through his final year of raising hogs for slaughter. Deeply immersive, the film is contemplation on life, death and personal ethics as it follows a pig farmer grappling with his conscience. Through sparse, intimate musings, the farmer reveals the growing conflict of a life spent “peddling in death” – one he can no longer live with. The pace of the film is unhurried, allowing the viewer to experience and absorb life on the farm, the herds of pigs – so clearly intelligent and trusting, the steel and concrete slaughterhouse, and the ghosts. 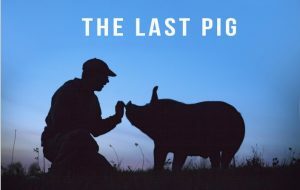 With bittersweet detail, against the stunning backdrop of upstate New York, “The Last Pig” is a documentary that offers an entirely new view of small-scale livestock farming and raises crucial questions about the ethics of eating. Sponsors: A portion of the cost to present this film was provided by a grant from Vegfund.